KUALA LUMPUR: Multi-Purpose Holdings Bhd (MPHB), a gaming outfit, have no plans to go big in real estate but will continue its joint venture development projects with Bandar Raya Developments Bhd (BRDB). The joint venture with property developer BRDB can easily generate more than RM4.5 billion in gross development value (GDV). Both companies are planning to jointly develop 268ha in Mimaland (Gombak, Selangor), Rawang and Penang. MPHB director T. Vijeyaratnam said the group would not hive off the joint venture with BRDB as part of its on-going rationalisation plan. "We may sell some of our land parcels if we get good offers but not the joint venture with BRDB. That will continue. We expect to develop the land over eight to 10 years," he told Business Times after its shareholders meeting last week. 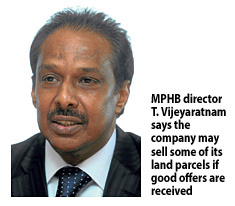 Vijeyaratnam said MPHB owned parcels of land in Kuala Lumpur, Penang and Johor that were worth around RM400 million to RM500 million. MPHB owns 1,840ha of agriculture land in south Johor. The land has strong GDV potential with the ongoing developments at Iskandar Malaysia. MPHB, which was set up in 1975, is rationalising its non-gaming asset like financial services held under Multi-Purpose Insurans Bhd, stockbroking operated by AA Anthony Securities Sdn Bhd and hotel investments. It plans to inject the assets, which have net book value of about RM941.4 million as at end-2011, into a special purpose vehicle (SPV Capital) for listing on the Main Market of Bursa Malaysia. Its gaming business, operated by Magnum Corp Sdn Bhd, will remain listed under MPHB. MPHB has so far disposed of Menara Multi-Purpose for RM375 million, a hotel in Pudu for RM54 million and shares in a subsidiary company. The disposal of the non-core assets has placed MPHB on a more even footing with Berjaya Sports Toto Bhd. For its fiscal year 2011, MPHB posted a net profit of RM482.03 million on revenue of RM3.54 billion, of which Magnum had contributed around 75 per cent to 80 per cent and more than 80 per cent, respectively. As of end-2011, MPHB has RM1.04 billion cash, short-term borrowings of RM53.9 million and long-term borrowings of RM2.11 billion. MPHB closed four sen higher last Friday to RM3.19.